Look at graph below. In 25 seconds, please speak into the microphone and describe in detail what the graph is showing. You will have 40 seconds to give your response. 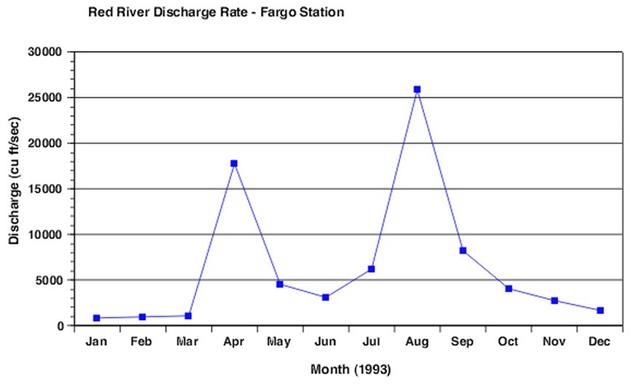 This line graph provides details concerning the Red River discharge rate during the months of the year 1993. The discharge rate is measured in cubic feet per second. We can see that the lowest discharge rates were in the months of January and December of that year. In January, the discharge rate was of about 1000 cu. ft/sec. In December, the discharge rate was of approximately 2000 cu. ft/sec. The highest discharge occurred in the month of August, reaching roughly 26000 cu. ft/sec, followed by the month of April, in which the discharge rate was 18000 cu. ft/sec. How To 'Describe Image' In PTE Speaking?